Its been a few weeks since the launch of AccuRanker 2.0, and a lot has been going on behind the scenes! The experience of our users has always been at the heart of what AccuRanker is about. With the release of 2.0 we wanted to bring you the best rank tracking experience possible - but we realise that there is not a one size fits all version that is perfect for everyone. So - we entered a period of tuning in to what our users were saying, the feedback we were getting and what people were asking for support with. We really wanted to know how users were experiencing the changes to the software, and what this meant for you, day to day as you use the system. And so, we are proud to bring you a round of updates, bug fixes, and as promised, the next round of brand new features and enhancements. As always, we want to know what you think. Get in touch, tell us about your experiences with the new system, and how these updates are adding to your overall experience with AccuRanker. There were a few elements of AccuRanker Classic that were firm favourites with users and so we have brought these into the new design so we can give you the best of both worlds! 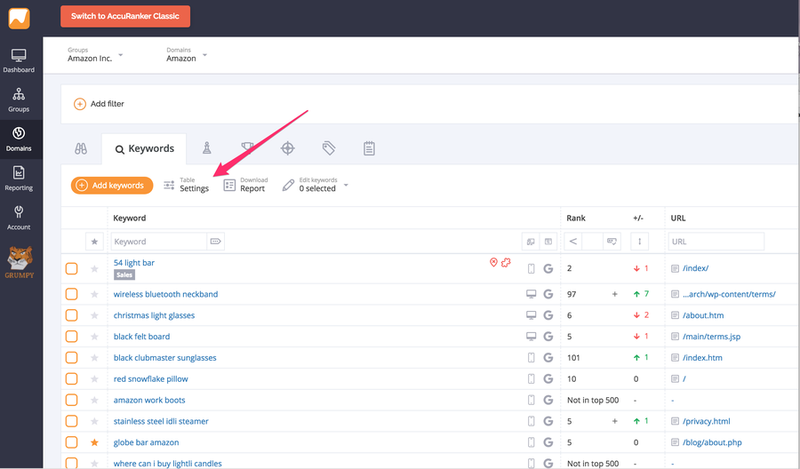 One of the main requests that we had was for the return of the Side Navigation bar - so we updated this to display the main navigation icons that take you, with one click, to your Dashboard, Groups, Domains, Reporting and your Account settings. This makes it faster for you to get to where you need to be, giving you a full overview of your account and where all your key points of navigation are located. The sub-navigation which in 2.0 had featured a drop-down menu has now been updated with a streamlined Tab navigation with icons for each of the keyword related sections - hover over each of these to get the title of each section and tab quickly between them to move around your sections. 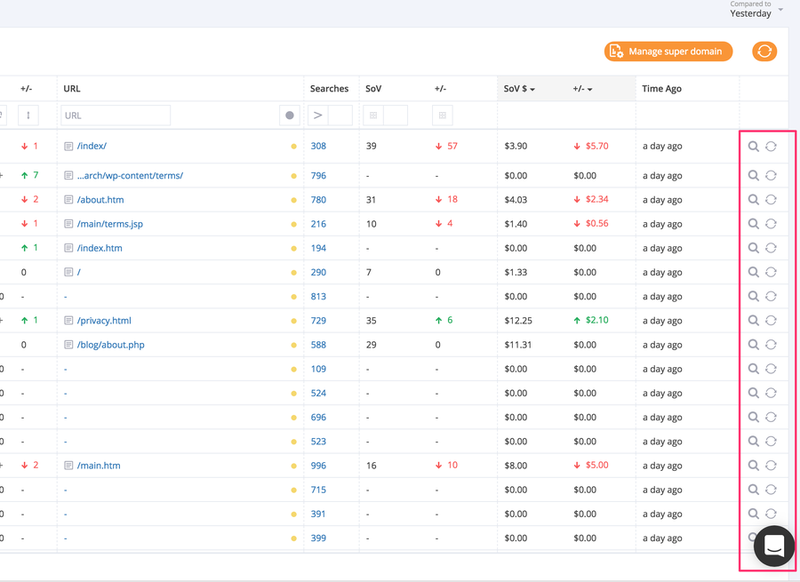 Like the overall main navigation, you can now move much faster and with fewer clicked. We assessed how our users experienced the navigation system and as a result have implemented a more natural UX to make sure your rank tracking experience goes as smoothly as possible. 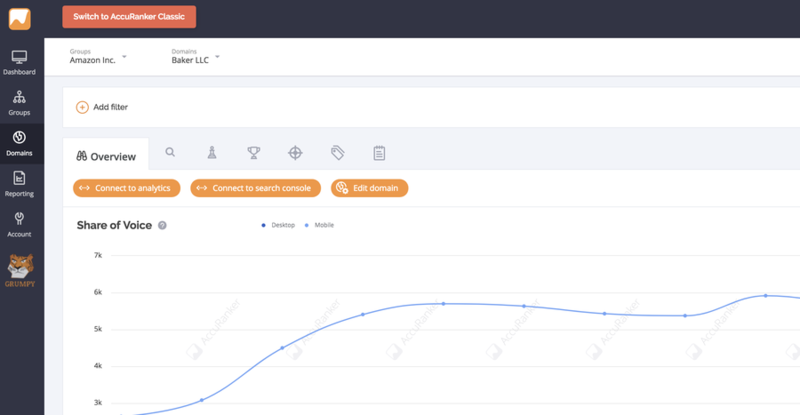 Another popular feature from AccuRanker Classic - you can now get an overview of all of your Domains and all of your Groups using the left-hand sidebar navigation once again. The Quick Navigate Function has also returned and can be found in its previous spot in the top navigation bar. 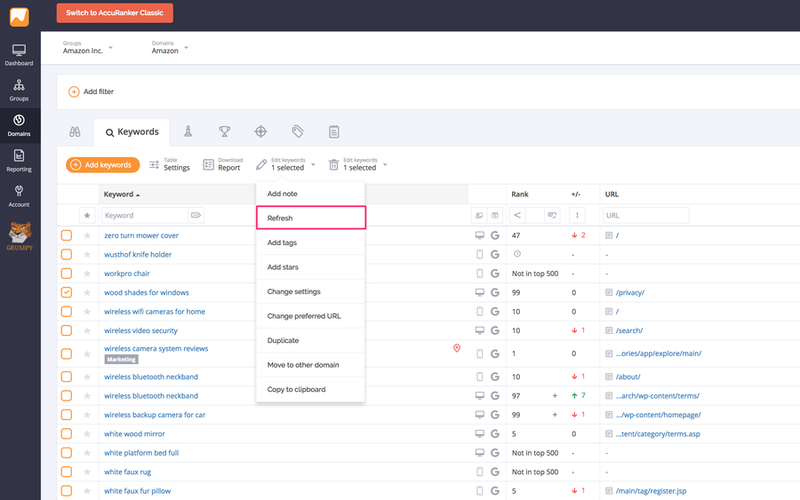 This was one of the most popular requested features from AccuRanker Classic, so we are happy to tell you that you can now once again refresh keywords one by one! To do this you simply need to tick the checkbox next to the keyword you want to refresh, click the edit feature and select "Refresh". Alternatively, you can click the refresh icon at the far right-hand side of the table on the line of the keyword you want to refresh. This firm favourite has returned and is now found on the Overview page. There were some aspects of AccuRanker 2.0 that required some further improvements to ensure that they performed as well as they could for users. 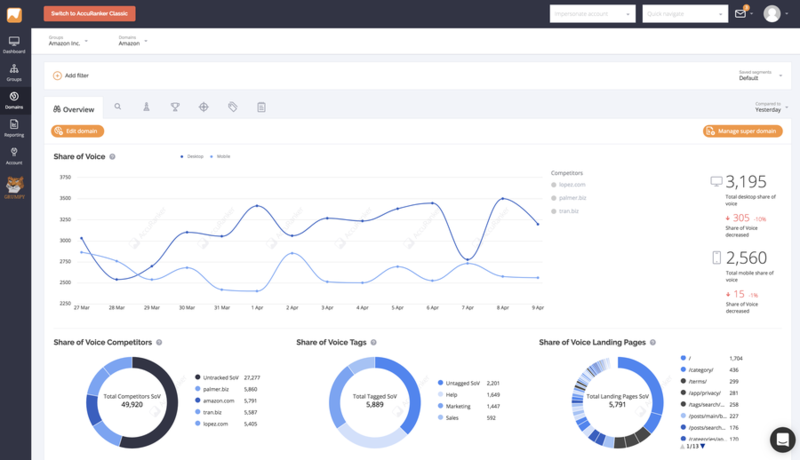 Although the Share of Voice is the preferred metric of the majority of users, we recognise that in some areas the average rank statistics are extremely valuable for long-term tracking and client reporting, and is recognised as an industry standard for users. We are happy to bring this back for those customers that use it. The new keywords table is an absolute goldmine of information that contains a massive amount of data! We took some time to evaluate the feedback and have redesigned the keywords table to enable you to customise the columns within the keywords list to only show the columns you want to view. This makes it easy to work with large volumes of data and navigate across your list. Set up your view exactly how you want and hide the columns that you don't want to make use of to make your view more streamlined. 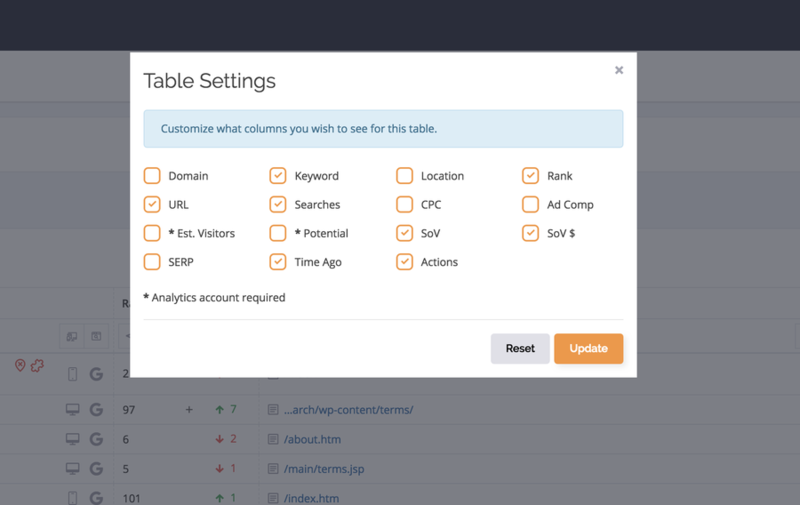 To do this navigate to you keywords table and click "Table Settings". You can then select the columns that you want to have in your view and customise it to look exactly as you need it - this means that the columns that you don't use on a regular basis you can deselect and ensure that what you see in your table is the exact information you need to work with. To return to the original view simply re-set to regain all columns in the table. In addition to the customisable columns, we have now removed the pagination and replaced it with infinity scroll so you can now scroll through your entire keywords list. This is a common issue within the industry when rendering thousands of rows of data and we designed the infinite page scroll to suit the needs of users that need to be able to move and scan through large volumes of data. This update avoids placing massive demands on the browsers to update and minimises loading delays. Adobe Analytics is a popular alternative to Google Analytics and many of our customers have asked us the possibility to be able to link to their Adobe Analytics accounts. with the rollout of the GDPR more and more companies are looking to Adobe Analytics to safeguard their web analytics data. You can now link your account up with your Adobe Analytics account in the same way that you link your Google Analytics. The new filtering and segments features have proved to be one of the most popular new features with our users - to further enhance the functionality of the features available we have re-introduced filters inside the table header - again in order to minimise clicks for the most common and popular filters. Now you can use the filter bar OR the filter table headers segment your data - whatever works best for you - when you enter a keyword in the table header tab, this automatically populates the main filter bar tab at the top of the page, chose between either method to filter, or use both together to get the maximum results from your data analysis. Dive into your account and take a look at the new and re-introduced features and let us know what you think? We are always happy to hear about your experiences - drop in to the comments below and let us know your thoughts - we will get back to you ASAP if you have any questions or if you need any help then we are ready and waiting to hear from you on our support function that can be found in the bottom right hand corner of your account. Don't have an account yet ... ? No problem - sign up here for your 100% free, no credit card required .